With over 40 major international trips outside the alps between us we'd managed to put together a reasonably experienced team. 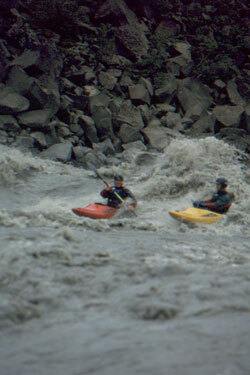 All of us imagined that Iceland would involve lots of steep creeking with low volume waterfalls. How wrong we were. 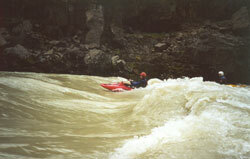 Almost everything we paddled was flowing at way over a hundred cumecs, some of it much more. 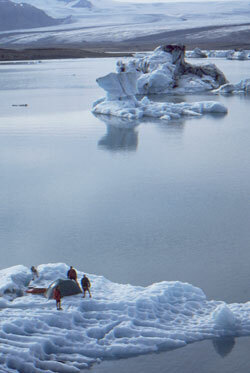 Overall, we all felt that Iceland was at least as good a destination as Norway. However, it would be easy to get into some serious difficulties due to the very large volume and presence of volcanic effects (sharp rocked drops, siphons) plus generally cold water and changeable weather. A lot of the sections are quite isolated although a walk out would usually be possible eventually. For these reasons, Iceland probably wouldn't be a good location for beginners, although if you've some big water experience (200 cumecs on up) and are looking for something a little different then Iceland is really worth moving up the list. Iceland is a wonderful place. The scenery is magnificent, with lots of tortured landscape, glaciers plunging down cliffs, lava fields, deserts and moonscapes. In a week we drove right around the island, a distance of around 1000 miles, but it is light until at least midnight and so evening drives are easy to do. The weather was generally superb, we had little rain and ate a lot of icecream. This is apparently not usual for Iceland but gave us all suntans. We took advantage of Go's cheap flights to Reykjavik. 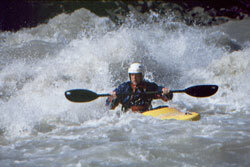 Go have a great policy for kayaks in that you can claim they are sports equipment and they'll take them for 20UKP. We managed to avoid this charge by using all the tricks, paying only 68UKP excess in total (20 out and 48 back), for 6 kayaks and a bike plus kit and camping equipment. Be careful here as you could get stung, Go make up for great flight prices by charging 4UKP per kilo excess with no leeway. The allowance is 20kilos each. We were weighed in at 127kg on the way back and they refused to waive the 7kg excess even though we were 6 people (only 1kg each !). The cheapest tickets on this route are 118UKP return ! These go fast so book early, we didn't and ended up paying 220UKP each, still a good price in my opinion. This is the expensive bit. The cheapest deal we could find was with Hoddi at Bilaleiga Islands who provided a 4WD Hyundai Starex (7 seater van type thing) for a mere 1200UKP for 9 days. More Icelandic rental firms can be found on; Hiring cars in Iceland. 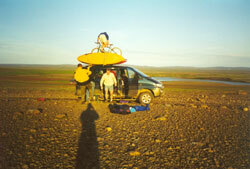 This vehicle was fine for our paddling needs although extended roof bars would have helped and kit space wasn't ideal. Note that diesel is less than half the price of petrol (0.35UKP/litre as opposed to 0.90UKP/litre) so a diesel vehicle might be a good idea. Lots of gravel driving and quite interesting roads to some of the put-ins, we used the 4WD capability a couple of times but could probably have gotten away without it. Still, the 4WD was reassuring on some of the more isolated roads. We found that the online Icelandic guidebook was pretty much spot-on. 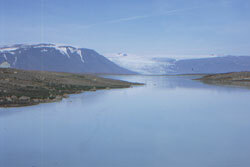 Our own additional river notes are included below together with similar guides to the Austari Jokulsa and the Tunguflot. Equipment wise we took the same gear we'd use in Scotland at Easter. Air temperatures average around 10degrees, water temperatures are around the pogie level. Camping wise, we dossed (or "wild camped") pretty much every night. Good wild campsites are not the easiest things to find due to the prevalence of lava and lack of flat ground. Still, many of our sites were truly beautiful. 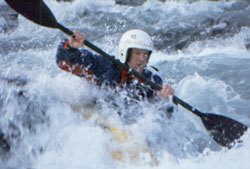 Further information can also be found on the web page of the Icelandic Kayak Club. or this alternative site (in Icelandic). As always, the usual disclaimer applies to all river information. Note that many Icelandic rivers are prone to massive floods due to Jokulhaups - volcanic eruptions under ice which release massive amounts of water downstream, so everything may be changed. Luckily as Iceland has very few trees you don't have to worry about wooden strainers, although because much of the ground is young the rocks are incredibly sharp, the rivers are full of silt and sumps are not uncommon. Oh, and some of them are quite cold (being glacial meltwater). Volumes are guessed and most likely within a factor of 2, but this sort of thing is difficult above 100cumecs or so. If anything our guesstimates have come out on the low side in the past. Level: 100cumecs first time - just flowing over Barnafoss blockage, 70cumecs second. Rocked drops, sharp rocks, lots of swirlies. Very scenic, right through the middle of a lava field. You can get in about 2km upstream of the bridge mentioned in the guide just above another slot rapid typical of those further down. Clive ran everything except for the rapid where an old bridge has collapsed into the river, no idea what rebar might be in this one. He reports no rocks hit but several drops looked horrid from the bank. We ran the 6km stretch used by the rafters which starts where the Icelandic guide suggests you take out. The playwave mentioned here was completely washed out due to the high level of the river, so we'd say the guidebook description was written for a much lower level (i.e. not "high"). The rapid approaching the bridge was the worst, forming a large whirlpool which could deal out quite a trashing if gotten wrong. A very scenic canyon that made a good warm-up. Access: Turn up the track running river right off the route 35, 4km outside Geysir. Drive 3km upstream until the track turns away from the river. Egress: Route 35 road bridge. One fall of note right after the start which you can see as you drive up, we ran it down the right. Quite playful and a little cold. Level: 350cumecs (high, see lower section above). Fantastic drive just to get to the put-in. The Dangleberry drop is the V, a 5m drop near the start. Isolated and very, very scenic, lots of big bouncy waves and boils. Beware of the 2m drop mentioned, this is at the end of a cliffed canyon section and was unportageble (and difficult to inspect) at this level. Lots of downtime in the hole at the bottom, although there was a line on the right. We also ran the lower volume alternate at the end, the two drops didn't look at all nice at high levels although the first most likely went. Do this. 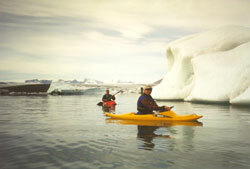 Incredibly pretty and lots of fun paddling around icebergs. Around 4km to the ice-face, further than it looks from the road. All big and bouncy, down the middle stuff. Waves big enough to backloop you. Inspected a couple of bits, one of which had a great window line at this level. Felt higher than the level the guide appears to be written for, perhaps washing out some of the more difficult features ? Awesome canyon, quite relaxing and very, very scenic. 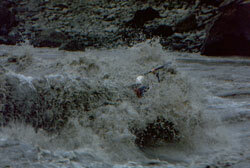 Some massive waves but line was generally down the middle, with large boils forming the only real obstacle as there were few bad holes. Not the hardest river in Iceland but perhaps the hardest rafted. Mainly III with a few harder drops, the hardest a rocky IV+ half of us portaged on the left. 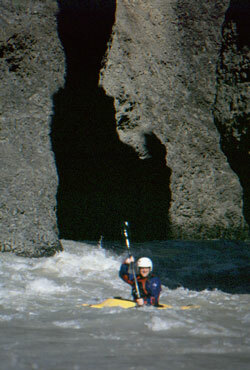 Deep, scenic canyon with lots of playwaves, one great one at the end. Access: Put on at Skatastathir, where the 758 ends above Bakkaflot. Take out where the rafters do at Villinganes. Both are on the left hand bank.